The Future Melbourne Committee has unanimously endorsed plans for the first new urban park in the Hoddle Grid since City Square was developed in 1980. The Market Street public park will be adjacent to Cbus Property and ISPT’s landmark Collins Arch development at 447 Collins Street. The new park will introduce 1,900 square metres of open space into the heart of Melbourne’s CBD, including City of Melbourne land, and a portion of land contributed by Cbus Property and ISPT that forms part of the development. Cbus Property is developing the park which will then be handed back to City of Melbourne for public use and management. The new park will be connected to a further 1,750 square metres of publicly accessible and occupiable space within the Collins Arch development via a large amphitheatre. The total open space added to the block will be nearly 30 per cent larger than the previous National Mutual building forecourt. Designed by award-winning landscape architects Oculus, in collaboration with a Project Steering Committee, which includes Council and Cbus Property representatives, the park will comprise a collection of unique public spaces, as well as wide bluestone paths to accommodate more pedestrians, new seating, space for programmed events and improved pedestrian access to public transport. The new park is extremely important for the CBD, from both an environmental and human wellness perspective, and continues to build on Cbus Property’s overall sustainability strategy, said Adrian Pozzo, CEO of Cbus Property. 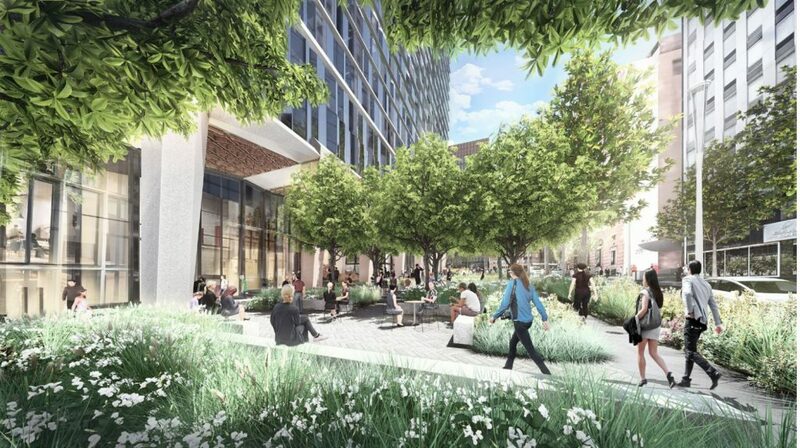 “Cbus Property is proud to contribute to the development of the Market Street park which will create a green refuge for future residents, tenants and visitors to Collins Arch and the wider CBD community.,” Mr Pozzo said. The park design will incorporate a number of environmentally sustainable design elements that meet the requirements of a modern and future focused city, as directed by City of Melbourne’s strategies and guidelines. The introduction of tree canopy, lawns and garden beds within the park will help mitigate the urban heat island effect, with the proposed Water Sensitive Urban Design elements minimising storm water runoff. “These design considerations will create a contemporary and functional public park, that will benefit the overall wellbeing of the community and the city environment,” Mr Pozzo added. The park design features a variety of trees and lawns and capitalises on the unique slope of Market Street, providing a line of sight the length of the park and down towards the river. The park incorporates a collection of spaces, including a City Garden, Central Plaza, a Terrace and Northern Lawns, to encourage different uses that are relevant to the whole community. Each space will create clear pedestrian connections via north-south links to public transport, the Northbank, as well as the broader precinct, including the Immigration Museum. “This landscape architecturally designed park is an important addition to Melbourne’s CBD,” says Claire Martin, Associate Director of Oculus. “The introduction of an open green space will help extend the urban forest for public enjoyment. The park design is distinctly Melbourne, drawing on the materiality and history of the surrounding CBD streets and heritage buildings, incorporating elements of bluestone and sandstone,” she added. The creation of the park will see the western side of Market Street repurposed into public space, while the eastern side will be transformed to include a new bike lane. The remainder of Market Street will become a single lane carriageway for southbound traffic and kerbside parking. The landmark $1 billion plus mixed-use Collins Arch development will include 49,000 square metres of premium-grade office space, 940 square metres of ground floor retail and a five-star W Hotel, as well as 184 luxury apartments. Collins Arch is currently under construction with completion expected in late 2019. The Market Street park is scheduled for completion in 2020. The City of Melbourne will decide on a name for the park at a future date.